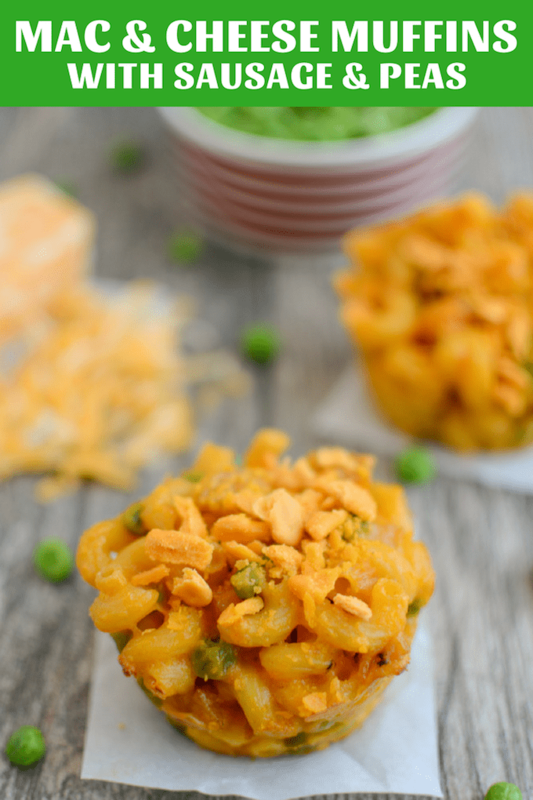 These Macaroni and Cheese Muffins are a fun way to change up your kid’s favorite dinner. They’re perfect to pack in a lunchbox or for an after school snack! Add sausage and peas for a protein boost and watch your kids gobble them up. Just popping in with another lunchbox-friendly recipe for you guys today. 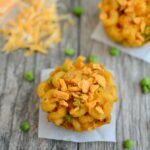 These Macaroni and Cheese Muffins are a fun way to put a twist on the mac and cheese dinner that every kid loves. I always try to boost the nutrition of mac and cheese by adding some healthy mix-ins. In this case, I used peas, chicken sausage and a little bit of pumpkin, but you can mix in whatever your kids like best. You could use chopped broccoli or some red peppers and leftover chicken or pulled pork would work just as well as chicken sausage. 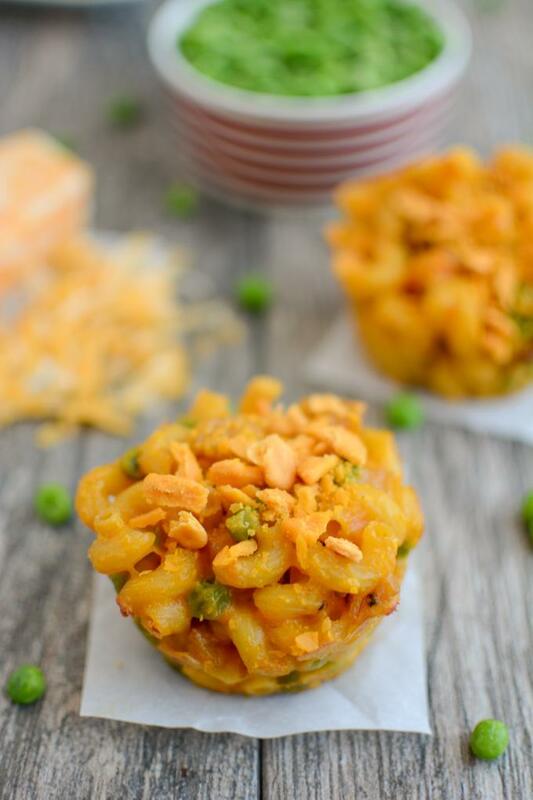 In other good news, you can make these fun little muffins with either homemade or boxed mac and cheese. I tested both. The boxed version didn’t stick together QUITE as well as homemade but still worked. I like these muffins because they don’t require utensils. You can pack them in lunch boxes or even throw a couple in a baggie and eat them for dinner on the go in the car. Another note- I used colby jack cheese when I made my homemade version of these, but I prefer regular cheddar. I also used 2% milk but you can use whole milk for a richer version. 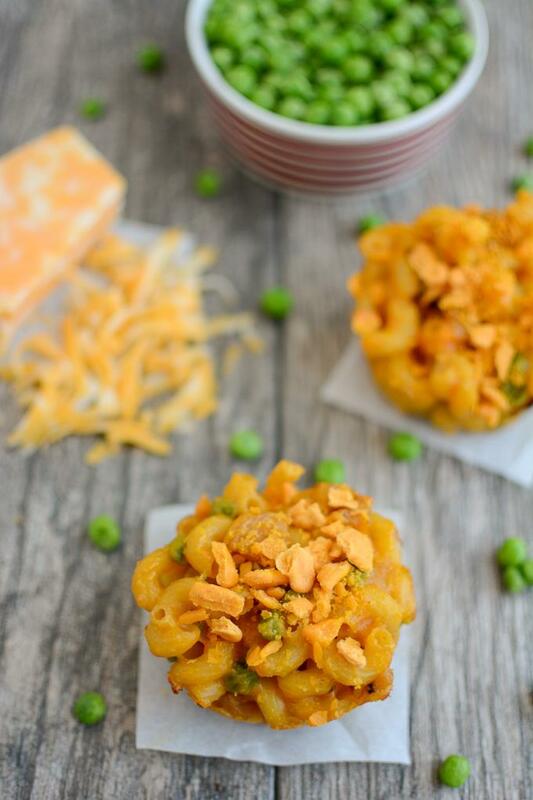 And I topped mine with crushed cheddar bunnies – you could use goldfish or panko breadcrumbs or even crushed potato chips! And use whatever pasta you want…but the smaller the better! Also, I used my silicone muffin tins for these and they popped out with no problem. If you’re using regular muffin tins, grease them really well or line them with parchment paper. In a skillet, melt butter. Stir in flour. Slowly add milk, stirring constantly to avoid lumps. Add chicken sausage, peas, noodles, garlic powder and pumpkin if using. Top with cheddar crackers or breadcrumbs. Let cool at least 15 minutes in the muffin tins before removing. Feel free to use your favorite homemade mac and cheese recipe. You can also used boxed mac and cheese. Prepare as directed and add your mixins. Change up the mix-ins as desired. Leftover chicken or pork and other vegetables will work fine. Essentially just make mac and cheese however you want. Feel free to use your favorite homemade recipe instead of mine, then bake, let cool and remove from muffin tins! Do you think these muffins would freeze and reheat well? Honestly not sure. I’d say it’s worth a shot but it might not work because cheese isn’t always great for freezing. These are so fun for kids!! They look delicious! In the recipe it calls for “1/2 – 3/4 cup frozen”…do you mean frozen vegetables? These look great! oops sorry! should say peas! updated it.